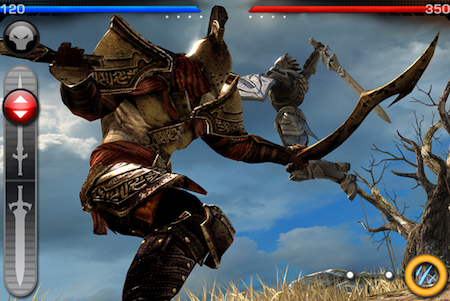 Action game Infinity Blade for the iPhone and iPad was updated today. The update adds multiplayer support, players can duel with friends via Game Center. â€¢ Enter the Arena: Challenge your friends to multiplayer matches online via Game Center! â€¢ Or play Survivor, and face off against a legion of Titans to see how far you can go! â€¢ New Holiday Helms! A new helm for every season, ready to be played and mastered! â€¢ Over two dozen new magic rings, swords, shields, and helmets! Collect and Master them all! â€¢ And More! New Achievements, more Leaderboards, and some new surprises! Infinity Blade is available for $2.99 for a limited time, a %50 discount.